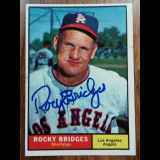 Everett Lamar "Rocky" Bridges is a former utility infielder with an 11-year career in American Major League Baseball from 1951 to 1961. He played for the Brooklyn Dodgers, Cincinnati Reds and St. Louis Cardinals of the National League, and the Washington Senators, Detroit Tigers, Cleveland Indians and Los Angeles Angels of the American League. He appeared at second base, shortstop, third base and, occasionally, in the outfield.